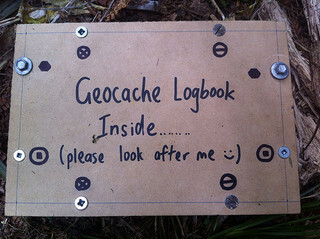 If you enjoyed hide and seek as a child, or still enjoy it, then geocaching is for you! Simply put, geocaching is a game involving the use of a global positioning system (GPS) to locate containers or "caches." It requires a person to register for membership (which is free) and to visit the hide and seek a cache page to either seek for a cache or hide one. All that is needed is a postal code and the selection of a geocache to start your adventure. From here, a GPS device (actual GPS, smart phone, etc.) is used to find the cache. Once found, the seeker signs the logbook and returns the cache to its original destination. To add to the activity, the seeker can then post pictures of the adventure and tell of any interesting stories while on the trek. 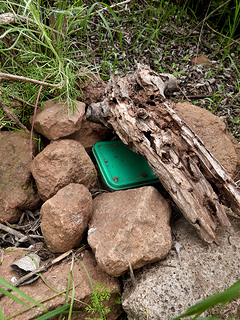 The art of geocaching is for those of any age who are young at heart. It is a safe and fun way to reduce one's environmental impact while playing a game and can be a fun adventure for the whole family. Cache's vary in difficulty from easy to more difficult hiding locations. Many cache containers are disguised, better hiding them and making for a more fun and challenging search. Though a fake rock may be difficult to decipher from a normal rock, this adds to the thrill of finding a hidden treasure for those who have always enjoyed games like hide-and-seek. What is fun about geocaching? Geocaching gets you out and discovering Erie County. You get to walk. climb and duck under things. It's exercise and adventure in one. You can take a friend or family member to help you look, enjoying an outing together. It's fun to see what others have hidden away in their caches and who has been there to sign the book before you. By posting hidden caches or pictures from your own personal geocaching adventures, you join a community of like-minded adventurers. The thrill of the adventure itself! 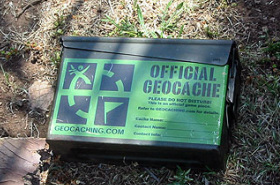 Geocaching: This site explains all that is needed to know for completing a geocaching adventure. Included are the rules and the do's and don't's of a successful geocaching setup/trip. Great Lakes Seaway Trail: A website discussing the Seaway Trail in the Great Lakes region which contains about 75 caches. Included is a list of locations in which to pick up logbooks. Pennsylvania Geocaching Trails: This site includes a list of geocaching trails within the state of Pennsylvania. Northwest PA Outdoor Adventure Group: A group in northwestern Pennsylvania which embraces geocaching as a form of recreation. Included on the site is a discussion forum and a list of sponsors. Boy Scouts of America: This links to the Boy Scouts of America's site about geocaching, specifically discussing the do's and don't's of a safe and successful geocaching program. GeocachingApp : There's an App for that. Find your treasure faster with this geocaching App. It provides the geocacher with a built in compass and other tools to help out with his search.